Here's my Sunny Days quilt, a quilt that was originally intended for Baby Brady, before we knew he'd be a he! 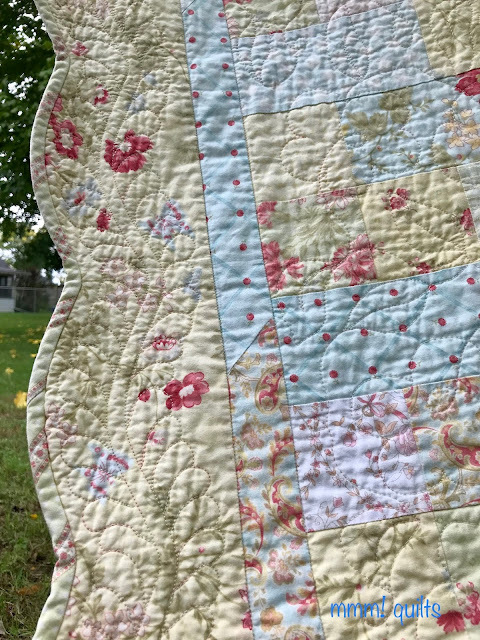 A couple of firsts happened with this quilt. The first 'first' was the imminent arrival of our first grandson, in July 2008. Brianne and Tim didn't want to find out ahead of time, so I knew I'd make a yellow or pale green quilt. I went to Cotton Patch Quilt Shop, then in Bradenton, now in Sarasota, Florida, to purchase fabric. There, I not only found fabric, but I also found the pattern for this soft quilt. It's a healthy size for a baby quilt. For the life of me, I can't recall or find the pattern I bought, and it comes with the template to make the scalloped edge! One day soon, my sewing studio will be set up and organized with a place for everything and everything in its place. It sewed up super-fast, just squares and rectangles. It's not a Turning Twenty quilt, but very similar, and may be by the same author. 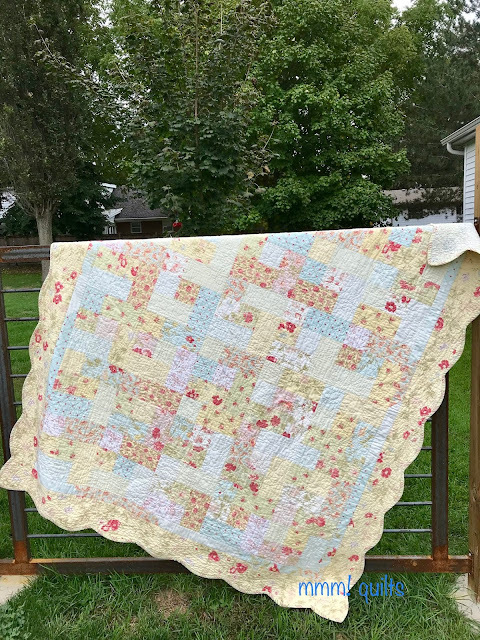 Once Brady was born--good thing his nana didn't have his baby quilt done in time for his birth--I put as much blue as I had in it, and limited the pinks. 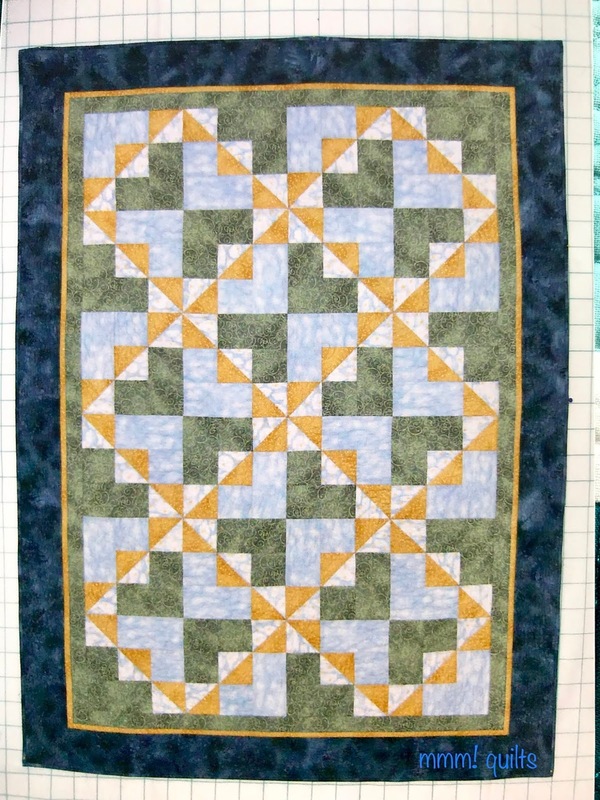 I even did a pieced rather than a solid inner border, all blues, but it still felt too feminine. So I put it aside, and made him a baby boy quilt. Here are the two photos I have of it just after completion in summer, 2008. This all came from stash. It's either 24 6" blocks or six 12" ones, can't recall, didn't write down what block I used. It's my own setting. Of course his name is quilted in it! Part of his last name is cut off on purpose. 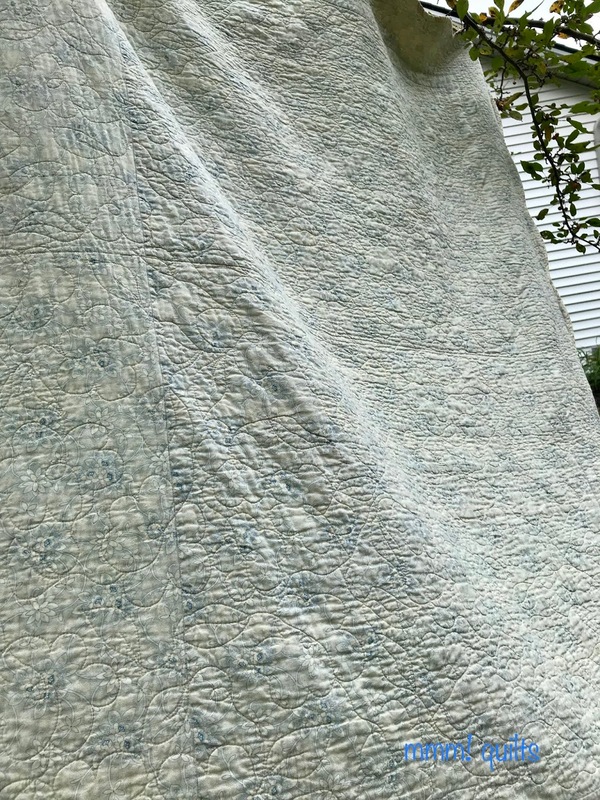 I quilted it on my Bernina with Sulky rayon variegated thread. Love the sheen. I believe it's a 40 wt. The back is a flannelette with lions on it; he's a Leo. That quilt has been well-used and well-loved, and has held up wonderfully. In December 2008, I decided to finish the quilt, as I thought it appropriate for our Florida condo we'd bought that year. Another first in this quilt is the non-traditional block, pieced by randomly choosing fabrics, no order. The other first is the scalloped edge. Previously, I'd done a runner with this edge, but never on a quilt, which requires bias binding. I'd bought a pale green and pink stripe for the binding (long love of striped bindings too!) so I was worried how it would look cut on the bias, but it turned out just fine. It was the perfect place for feathers, a long-loved quilting motif of mine. Note I didn't do a fill behind them along the inner border; yet this hasn't been a problem, and the quilt has been pretty well-used, and washed several times. I did feathers along the outer edge and did a leaf inside. I wasn't confident about stacking feathers in that narrow an area. This looks fine as there are leaves in the meander on the quilt. I mitred the corners just as for a 90° corner. I took it with me to Florida on our Christmas trip that year, and sewed down the binding to the back by hand on the plane! 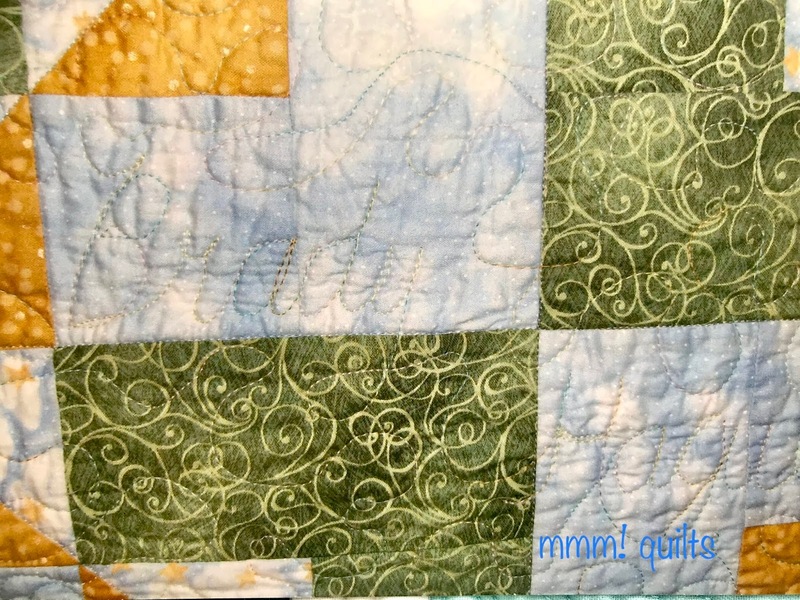 The backing may be familiar; it was used on last month's TBT quilt, Windy Day Fun! As I said then, I bought several metres of it as it is such a great backing. It's all gone now, maybe the odd scrap in the blues bin. Here's a look at the texture. No sun when I was taking these shots; it was out earlier for a bit when I was on my walk. You can see a couple straight lines of quilting on the back; I always stabilize the quilt even when doing an all-over, by stitching in the ditch in a grid along the block seams. 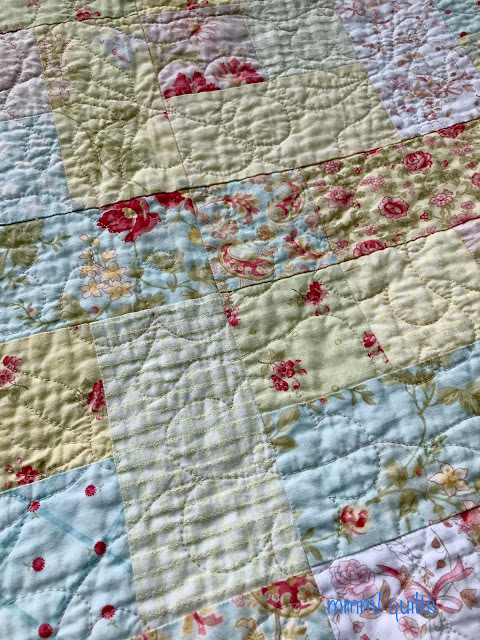 I did an all-over meander on the quilt, one of my favourites, that I still do on the longarm, an open poofy flower and loops and leaves. 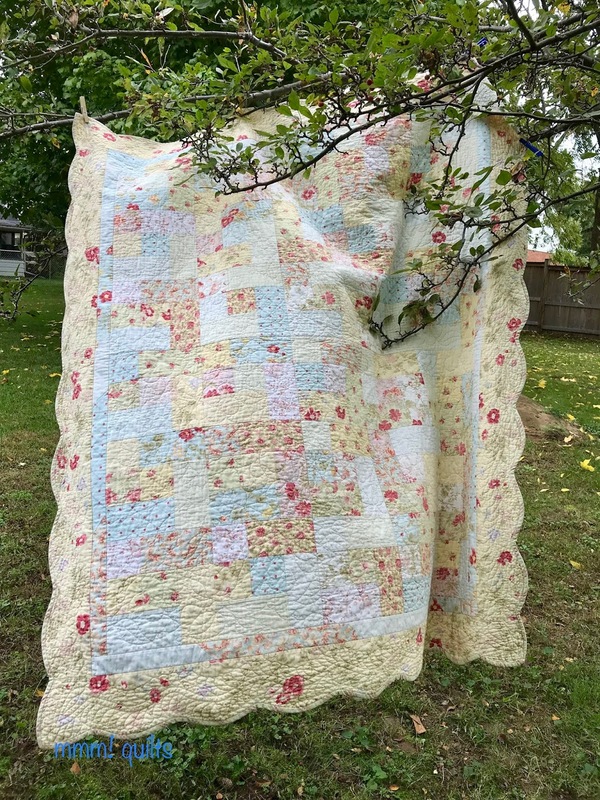 It's great for a quilt like this. That green is a woven fabric, ah the texture on your fingertips! I can't recall (and don't have any notes) as to whether I quilted this in thirds, but if not thirds, then halves. You can read a tutorial on doing that here. It, along with spray-basting, changed my quilting life round about 2000, five years in. The previous five years I was not as enamoured of the quilting part of making a quilt, mainly because of a "hate safety pins" relationship (hit 'em with my needle, or sewed over them, and then had to break thread, or poked myself MANY a time closing them, yeah yeah, I even used a grapefruit spoon to help close them, not a fan). Rather faded, written with a brown Pigma Micron pen. Sherwood Park, AB, Dec. 2008. This quilt was named Sunny Days because almost all days in Florida are sunny, and having that condo to go to in every school break helped me get through the last years of teaching. I never did do well in the long dark frigid months of winter in Alberta, especially after having spent five years in Essex County, where the winters are a lot milder and shorter. I need sunlight. My family rolls their eyes when I talk about weather, but I am mildly affected by it, and I know a lot of people who are. At least Alberta does have the blue skies and sunshine, even though the winter days are short, and the outdoor temperature may be -30C for days and days on end. So the quilt has stayed with me all these years. 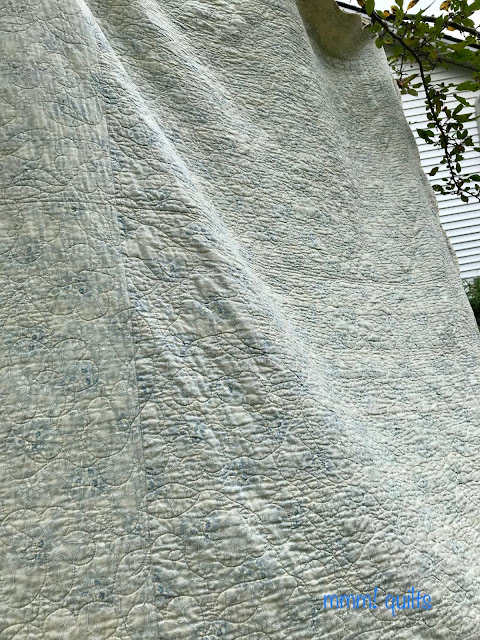 It's been used as the extra quilt I like to have, even in menopause, even in summer, because of running AC, on top of me on my side of the bed. 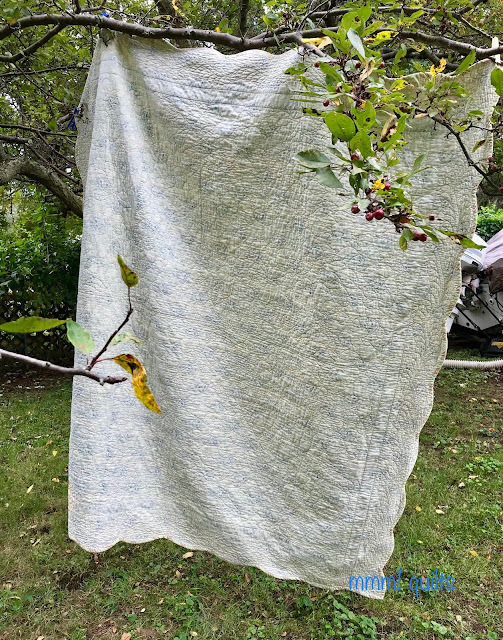 During the day I either fold it and drape it across a corner, or roll it and set it on top of a couple of other rolled up quilts. A windy day today, even in our sheltered yard, meant it flapped around a bit in the crabapple tree, but I like this shot anyhow. Our humongous maybe Norway, maybe Sycamore maple tree is starting to turn yellow, and dropping some of its leaves. 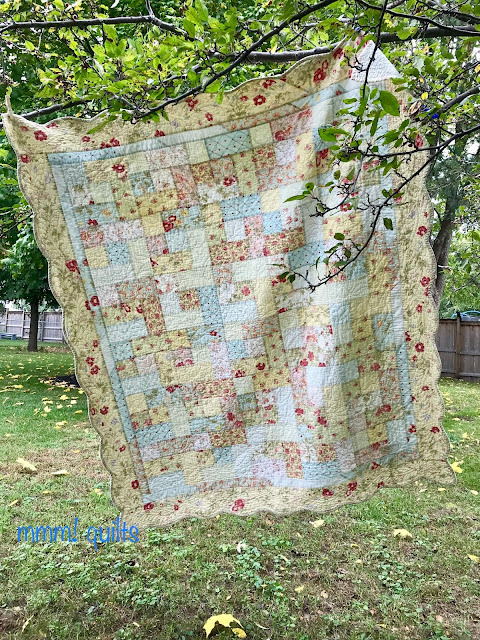 I love autumn now we are living back here, where it is soft and gentle, like this quilt; however not soft colours, but glorious vibrant one that make my heart sing, as Mother Nature slowly adorns herself in her autumn finery. Well, this is a surprise! I thought maybe you'd take the month off posting a TBT, too. This is such a soft, pretty quilt. I can see why you still use it. (And don't they just get softer with time and use?) The scallops are perfection, and oh my, you were doing awesome feathers back then already. 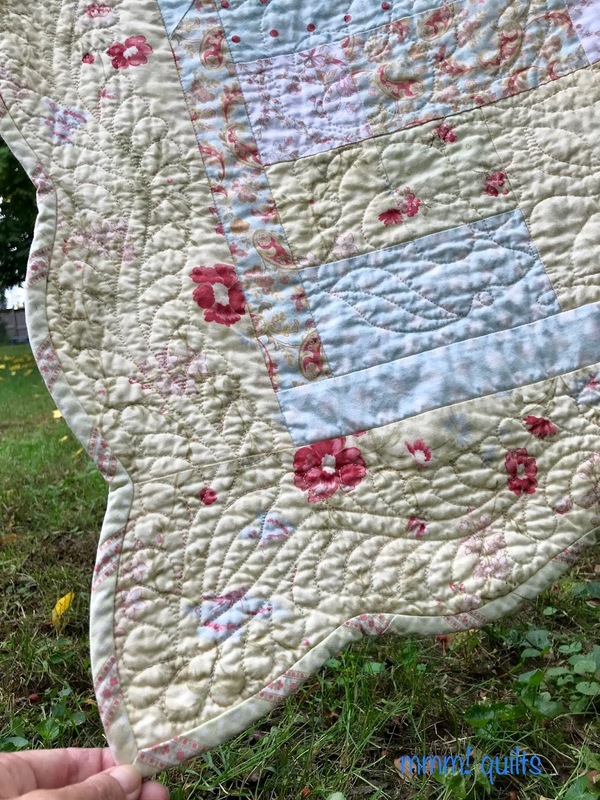 I see you used Sulky Blendables for quilting. I was just looking at that thread the other day considering if I'd like to try it. I do like the quilt you ended up making for Brady. I need to study it a bit more to see how you pieced it. Those soft colors in your quilt are so lovely. I can understand why you keep it close by! Love the photo in your tree. Our trees are changing color quickly and the weather took a 40 degree drop yesterday. Autumn is definitely here! Hope you had a wonderful time with B&B. It's always hard to see them go, right? 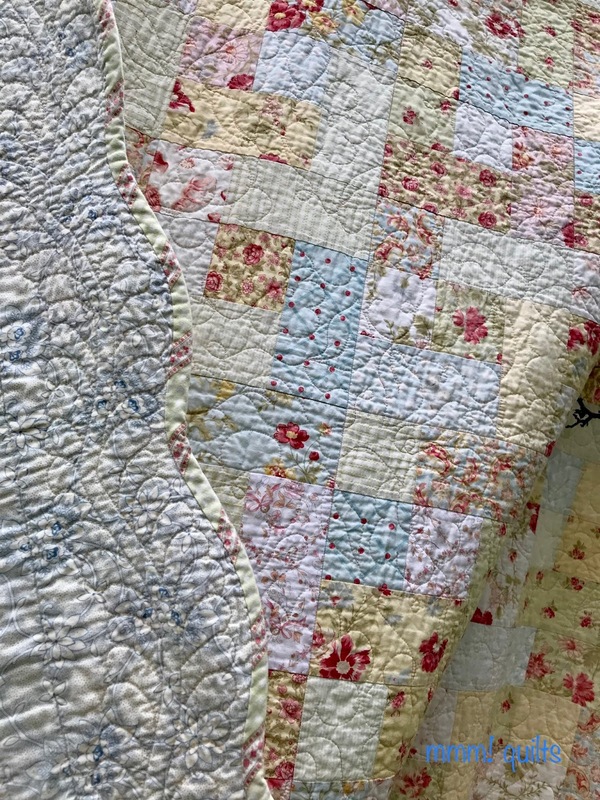 Two such sweet quilts. I loved seeing Brady’s name in his first quilt. 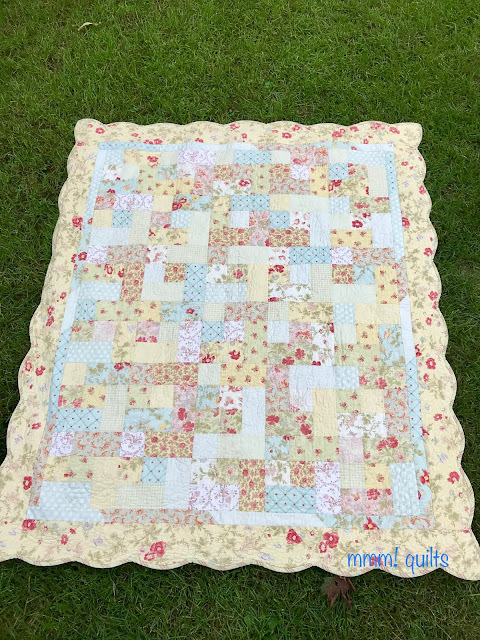 The floral quilt looks so soft and cuddly. I can see why it is still a favorite. I love the connection to Brady, so it's the perfect quilt to share today and drape yourself in until things return to "normal". A I miss Brady quilt to cuddle in until you get to see him again. Love the soft colours of the quilt and those scalloped edges! I'm with you totally on the pins, I hate them. Basting spray saved my sanity. Another lover of feathers as my blog post today shows. 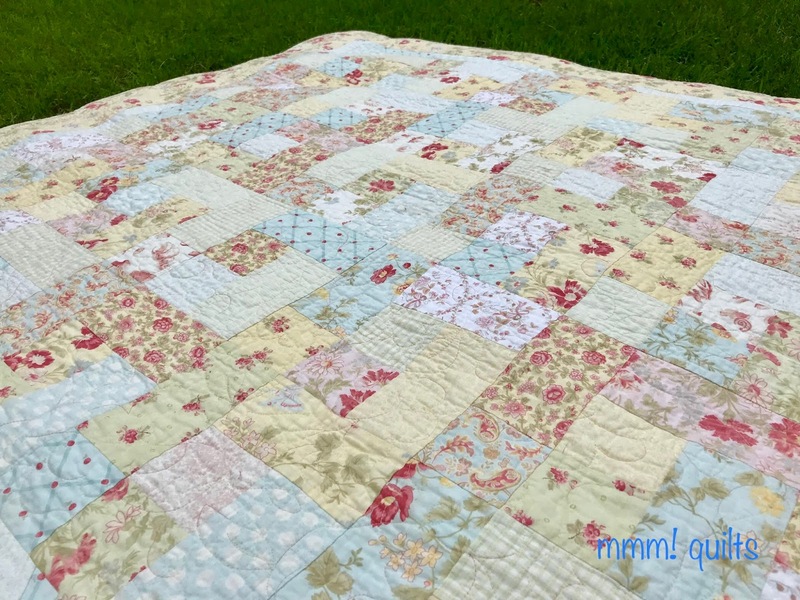 Two beautiful quilts, and I loved reading your posts on quilting in thirds and on using basting spray. I have tried basting spray one time and did not have good results, but after reading your post, I realize my technique wasn't good, and I think I will try it again. Thank you! I like both quilts, but I really like the quilt that Brady didn't get, the quilt his nana has to remind her of Brady. I love the crinkly softness. I can't get my head around how you bind a scalloped edge, interesting. Yes, do show the quilting, I need all the quilting help I can get! Sunny Days is beautiful, and very feminine. The scalloped edge sets it off beautifully. I have had problems with spray basting but I’ve Bee thinking about it and it may be my technique that needs revising, I will try it again I think. Brady’s quilt is lovely too, You really are a most thoughtful Grandma. Hi Sandra, what a lovely quilt! It was probably a little to feminine for baby Brady, even when we try to be more gender neutral :-) But then he got a cool colourful one and you got a gorgeous gentle quilt. I really love the quilting you did on the ends of the scallops. It looks great! Thanks so much for letting me host TBT. I'm glad you had a good time with Brady and his mom. I enjoyed reading this post very much, but am sorry it’s genesis is Brady's departure. Sorry that Brady is not with you now; I am sure you miss him and his mother tremendously. 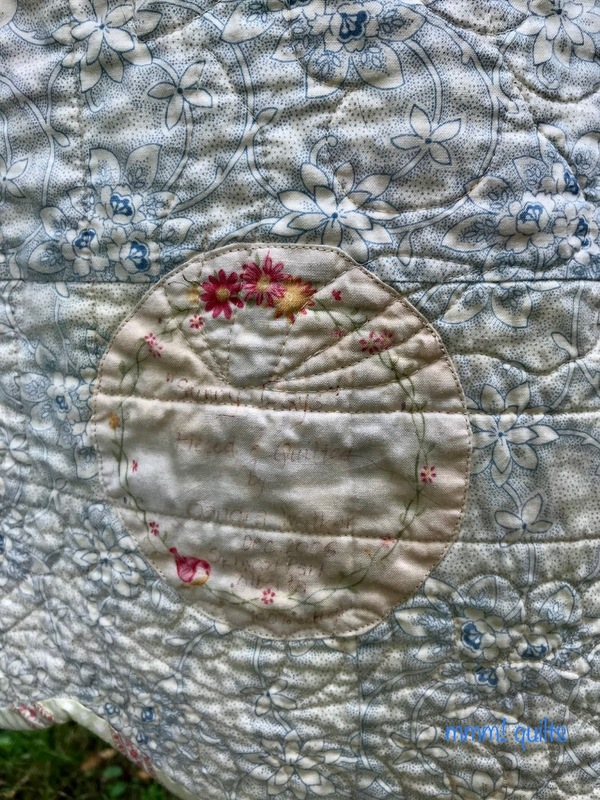 I love the quilt stories and the reminder about basting/quilting in thirds/halves. It is always good to have tricks up our sleeves! Enjoy your well deserved break from TBT. Not only it's a lovely quilt, it must also makes you think of Brady. Cuddle under this soft and cosy quilt, until you start feeling better. It definitely has a feminine feel, even with the added blues. It's beautiful and those scallops along the edge are just perfect.